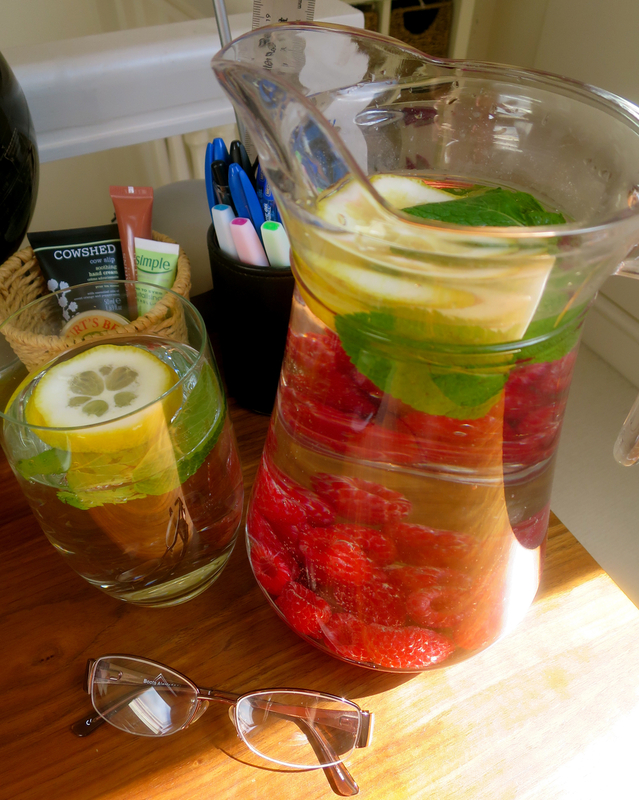 The pleasures of fruit infused water! I never drink enough water. Ever! I know I'm supposed to and I know it's really good for you and I know that surviving on endless cups of caffeine infused tea every day isn't doing me much good (oh how I love tea). So the other day whilst feeling a little parched at my desk working on the blog I decided that enough was enough and that I must make more effort to refresh myself in a more productive and healthy way! The problem is I find ordinary water so very boring. Inspired by my habit of drinking a freshly squeezed lemon in hot water first thing in the morning, and also by a recent holiday in Portugal where the reception desk offered fresh fruit infused water of all varieties and combinations on a daily basis, I started to look at infused water ideas online and decided to try out a couple for myself. I was surprisingly pleased with the results and have been happily supping away ever since! An afternoon spent slicing and splicing. So these are the combinations that I have tried so far (and I intend to keep on trying new ones daily this summer as they have truly perked up my water consumption habits!) some are classic combinations, others a little bit different to the usual. I don't really go by certain quantities as such, I kind of just throw everything in as I think fit. Number Two: Lemon, Cucumber and Fresh Basil. Lemon, Cucumber and Fresh Basil. Number Three: Pomegranate and Mint. Number Four: Raspberry, Lemon and Mint. All have been truly delicious and delightful. I think they're well worth a try, you could quite quickly and easily make these the night before work, refrigerate to let the fruit and flavours truly infuse and then decant into a water bottle to take to work with you. I recommend trying this bottle here from Lakeland that is very handy and hardy! If you try any of the above or have any suggestions for new combinations that I should try then please do let me know in the comments box below - I'd love some new ideas!